Happy Indian Summer! With fresh apples arriving, you'll find this pantry friendly cake a snap to whip up, glaze, and serve with ice cream. I often double the Brown Sugar Glaze so I can drizzle it over ice cream too. Warm days and cooler nights will soon bring rosy banks of apples to market. I keep resisting, but hard as I try hanging on to summer, I’m falling into autumn. A family favorite each autumn, I hope you will enjoy this heartwarming Fresh Apple Cake with Brown Sugar Glaze. It’s easy to pack for early fall picnics and tailgating. Best of all, your home will smell heavenly. You might just have to hide this cake before getting it out the door! 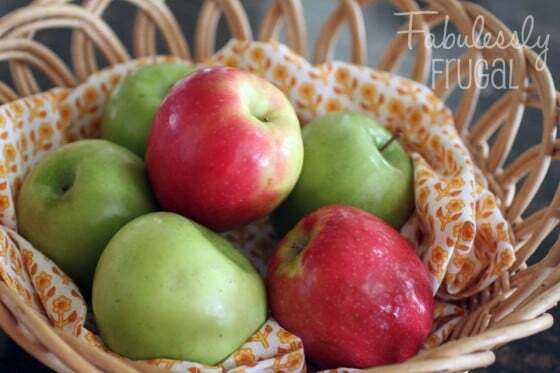 We can buy apples year-round, but once picked they continue to ripen even in cold storage. Eventually they become mealy and dry, so this is the time of year to enjoy eating fresh apples, along with baking pies, cakes, strudels, and crisps. I’m looking forward to pressed cider and making homemade applesauce too. Begin by preheating the oven and preparing your pan. Core and chop apples along with nuts. Combine the dry ingredients, beat the eggs, and add oil and vanilla together mixing well. Pour the batter into prepared pan and bake for 40 to 45 minutes. Set the cake on a wire rack to cool. While the cake is still hot, prepare the glaze. Combine ingredients and cook over medium heat, stirring often, until the mixture comes to a gentle bowl. Continue cooking for 3 minutes. Pour the hot glaze over the warm cake, gently spreading it to cover surface. Let the glazed cake cool completely before serving. Enjoy, Fresh Apple Cake with Brown Sugar Glaze. Makes 16 to 24 servings. Enjoy the brightness of the crisp days ahead. Please share your favorite autumn fruit and how you like to use it. I’d love to hear! Preheat oven to 350˚F. Grease a 9x13-inch pan and set aside. In a medium bowl, combine the flour, sugar, baking soda, salt and cinnamon. In a large bowl, beat the eggs until light and foamy. Add the oil and vanilla and mix well. Stir in the flour mixture with a spoon and continue stirring the batter until the flour disappears. Add the apples and nuts; mix well. Pour the batter into prepared pan and bake for 40-45 minutes, or until a toothpick inserted in the center comes out clean. Set the cake on a wire rack to cool. While the cake is still hot, prepare the glaze. Combine the brown sugar, butter, vanilla, and heavy cream in a medium saucepan. Cook over medium heat, stirring often, until the mixture comes to a gentle boil. Continue cooking for 3 minutes. Spoon the hot glaze over the still warm cake. Let the glazed cake cool completely before serving. Yield 16 to 24 servings. We used your recipe for Fresh Apple Cake with Brown Sugar Glaze at https://fabulesslyfrugal.com/fresh-apple-cake-with-brown-sugar-glaze/#comments. So sorry you did not enjoy the cake J. C. Please feel free to “tweak away,” and share your tips here! Thank you for replying. Comparing your recipe to similar recipes, if I were to use your recipe again, I would try adding more liquid, such as apple juice. The problem with the “Cake” part of the recipe is that it was not moist enough; in fact, it was “chewy” instead of a soft, moist filling.